If you’ve been reading this blog long enough, you’d know that I am a bit of a shopaholic and a sucker for bargains. My recent addiction though, are travel books. Now, I love to read. I love books. However, I’m not as fond about buying them. For one thing, I am not the most careful book owner. Secondly, I go through phases where I’d go crazy over one author, buy or borrow all his/her books and read nothing but their work for months. That’s why I hesitate to buy books that goes beyond a certain price. My first travel book (apart from guide books) was Vroom with a View by Peter Moore. I found it at this record store in Yarraville that has a table with a bunch of brand new books at discounted prices. My second find was my first Bill Bryson book, Down Under. It was in good condition, though it was second hand. A pretty good find for a hardbound book at AU$3.99. From then on, I was always on the lookout for familiar names, hoping to get another good find. I did found another Peter Moore, The Full Montezuma . It was well worn, to say the least, but at only AU$0.50, I’m not complaining. I was also able to find Come Fly with Me, a collection of travel stories from around the world, edited by Sarah MacDonald. During my stopover in Singapore, I fully intented to just stock up on Pinkies and Mangas. In my quest to get to my goal, I managed to stumble upon a couple of stores selling second hand books. Aside from a must-visit place for toy collectors, China Square Central also have a weekend bazaar where independent sellers can rent a booth to sell their goods. Apart from the toys, the clothes and accessories, there are also stalls that sell second hand books. It was in one of the hobby stores though where I found Holy Cow! by Sarah MacDonald, a book about her adventures in India, for only SG$10. While hunting down the last couple of volumes to complete my Ouran High Host Club loot, I went to the biggest (?) Popular bookstore in Singapore; the one in the Bras Basah Complex. It turns out that this place is also home to more than a couple second hand bookstores. It started raining heavily while I was browsing inside Popular, and it still haven’t let up after I paid for my books. To pass up the time, I browsed through the other stores and found By the Seat of My Pants: Humorous Tales Of Travel And Misadventure from Lonely Planet for only SG$9.90. Unfortunately, Manila bookstores have very limited selection of travel books. Not only that, they’re past the price I’m willing to pay. Last week though, while waiting for the Shroud of Turin tour to start, I felt something calling out to me, the same feeling I get when I know I’m going to find something good inside trift shops. 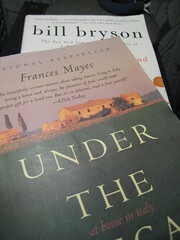 True enough I chanced upon Frances Maye’s Under the Tuscan Sun AND Bill Bryson’s Notes from a Small Island. Save for a crease or two, both books are in pretty good condition. And the price? Php110 (approximately US$2.40). Not bad, eh? Starting your travel book library doesn’t have to be expensive. If you know where to look, the authors to look for, and with a little bit of luck, you will be starting your collection in no time! See if you can find a copy of Peter Mayle’s “Chasing Cezanne.” It’s about a photographer who uncovers an art scam with a Cezanne, but it’s a wonderful travelogue of the South of France and some parts of Europe as well. Haha, in fact, I think the book should be retitled more aptly, “Traipsing leisurely and wining and dining all over Europe while apprehending an art scam on the side.” Haha, imagine stopping to eat and take tourist shots while in hot pursuit of a stolen Cezanne. There’s often one in Book Sale or Books for Less, it has a mustardy yellow cover that you won’t miss. Part of this is due, of course, to my own lack of travel experience, and accompanying lack of confidence. Indeed, were I not acquainted, as such, with the author of JustWandering, and if I hadn’t read pretty much every article on this blog, this particular post might have “turned me off” for the casual way in which she glibly chatters about shopping in various cities I’ve never seen and confidently talks of spending money in a variety of foreign currencies. There’s a “sophistication” to people who casually toss around “jet-setting international references” that leaves me feeling uneasy. Okay, it’s not just “uneasy,” it’s “envious.” And often, “stupid.” The fault is mine, I suppose. I’ve been to very few places, my travels always cost me more than I expect, and try as I might, I feel like a “tourist” rather than a “traveler” wherever I go. So… what am I doing reading a “travel blog,” then, huh? In this case it’s obviously silly for me to have this kind of reaction. I mean, Niña is talking about finding thrift-store bargains in second-hand shops! And she’s telling us where to find those shops and those bargains! I could have used her help the last few times I traveled. Twenty-some euros for a map book… which I ended up barely using? Maybe I’m just traveling in the wrong countries. I need to go someplace cheaper. And take somebody along who speaks the language and knows how to find bargains. For the most part, JustWandering is “realistic,” and that’s why I like it so much. The writer isn’t “rich,” nor is she a “poseur” like those backpackers on the “Globe Trekker” type TV shows. (One of those shows shot an episode where I live; what a load of tripe that was!) Niña looks for cheap air fares, flies in the crowded, uncomfortable coach class, and delights in finding cheap food and cheap hotels and hostels… and she does this out of necessity. She doesn’t boast about being a great writer or photographer, she doesn’t “name drop” about fancy hotels or restaurants that would cost me a week’s salary for lunch. Contrast this to many travel writers who travel “on assignment” with a book, magazine, or TV contract in hand, knowing their expenses are covered. The “backpacker” crowd, often as not, has mummy & daddy’s trust fund money to fall back on when they go back to Eaton or Haahvaahd after their around-the-world stint. I don’t really see the point in going unshaven and staying in hostels while swilling six-dollar beers. That’s not “traveling,” that’s “acting.” Pompous little gits. I don’t care much for travel books about people doing things I don’t have a prayer in the world of accomplishing. Skiing to the south pole? Climbing Everest? Spending a year circumnavigating Australia on a bicycle? How the hell am I ever going to afford to take a year off to circle Australia on a bicycle? How much would that cost? Thirty dollars a night at hotels (if you can find it… when I was in Australia it was more like sixty to a hundred) for three-hundred sixty-five nights adds up fast, as does food. I don’t know about Australia, never having camped there, but in the US, a tent camping site costs from ten to thirty dollars a night, and many parks and sites require reservations months in advance. Not that I have the endurance to cycle three-hundred sixty-five meters, let alone three-hundred sixty-five days, but still, it’s the idea. When I travel I end up at McDonald’s a lot, because they have a “dollar menu,” or a “euro menu.” I dunno, do they have a “peso menu” in Manila? I don’t recall a “baht menu” in Thailand. I didnt’ go to Chiang Mai in Thailand, which is where all the “travelers” go to see the “real” Thailand. I went to Lop Buri, where I was bitten on the ear by a monkey that tried to steal my hat. I kind of like Bryson’s books because he comes across as a “regular guy,” even though he’s a successful author who doesn’t have to worry about money and already has a lucrative book deal in hand when he hits the road. At least he’s willing to paint himself in a less than favorable light sometimes, admitting his own shortcomings and mistakes as he travels. Part of this, I suspect, is merely “art,” the creation of a “persona” with whom readers like me can better relate. Still, it helps me forget that he’s smarter, richer, and far better traveled than I will ever be, so I can tolerate his books. Plus, he usually eats at cheap restaurants. I can relate to that. After all this griping about “moneyed” travelers, my two favorite travel authors turn out to be rich guys. Richard Halliburton created a persona for himself when he wrote “The Royal Road to Romance” in 1925 as a son of wealth who turns his back on family money to work his way around Europe. His first book is truly grand, followed by the even more glorious “The Glorious Adventure.” After his first two books became best sellers, Halliburton was wealthier than his parents. He still wrote with a certain charming enthusiasm, but he was at this best in his first two books. E. W. Howe’s “Daily Notes of a Trip Around the World” is the kind of writing I wish I could master. Howe was a “blogger” a hundred years before blogging was invented. He was a newspaper publisher who, despite considerable misgivings, set out on a round-the-world cruise in 1905 at the urging of friends and family. Perhaps they simply wanted him out of the way for a while, as he was quite the crotchety, opinionated grouch… which he cheerfully admits. He chronicled his round-the-world adventure in daily journal entries, which he sent back home to his newspapers in the form of letters for publication. Today, Howe’s letters would be blog entries. A few years prior to “Daily Notes,” Howe penned “The Trip to the West Indies,” an equally entertaining series of daily travel updates. I don’t want to read travel books about “dramatic” adventures. I don’t want to read any more books about teenagers who sail solo around the world. (I’ve read two such books… they leave me feeling as though I’m a loser who has wasted my life. Why wasn’t I sailing around the world when I was 16? Why aren’t I sailing around the world now?) I want to read about “average” people who decide to do something “interesting,” but in a way that, you know, maybe I could do, too. From what Niña says, it sounds as though “Vroom With a View” might be kind of like that. I’m looking for it. The library doesn’t have it. Amazon does, altho’ it’s something like six weeks shipping time and costs twelve bucks. Don’t even talk to me about Anthony Bourdain. I hope I see him at La Tomatina sometime. I love you lots, Niña, because you’re “real” and you live what you write, and you write about regular people with little money who love to travel anyway, and who figure out ways to make it happen. Thanx for being such a great “travel buddy,” and for taking us along for the ride. Sorry this is so long. Feel free to edit or delete it. Oh, and since we’re talking about McDonald’s, I actually make an effort to try the American fast food chains wherever I go. I like to see what changes they employ to adapt to the local taste buds (such as the Ronald MacDonald giving a wai in Thailand, KFC giving you a packet of chili sauce instead of gravy to go with your order of fried chicken, etc.) I don’t care of eating fastfood revokes me of my “traveller” badge; I will do and eat what I want! McD’s serves beer in Spain!